I haven't seen these before. 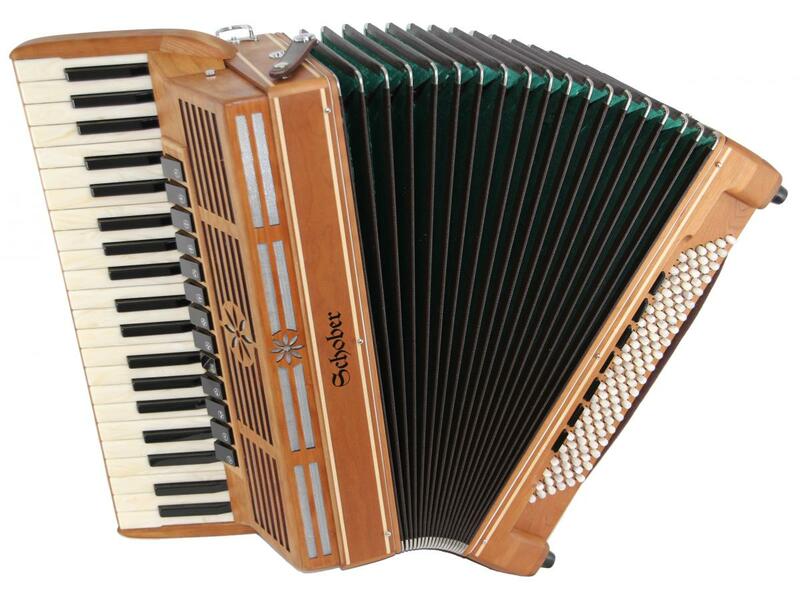 Schober is a line of German-designed, Italian-made accordions. I can't tell when exactly they launched, but according to the Web Archive they've had piano accordions since at least 2014 (and Steirische since 2013). 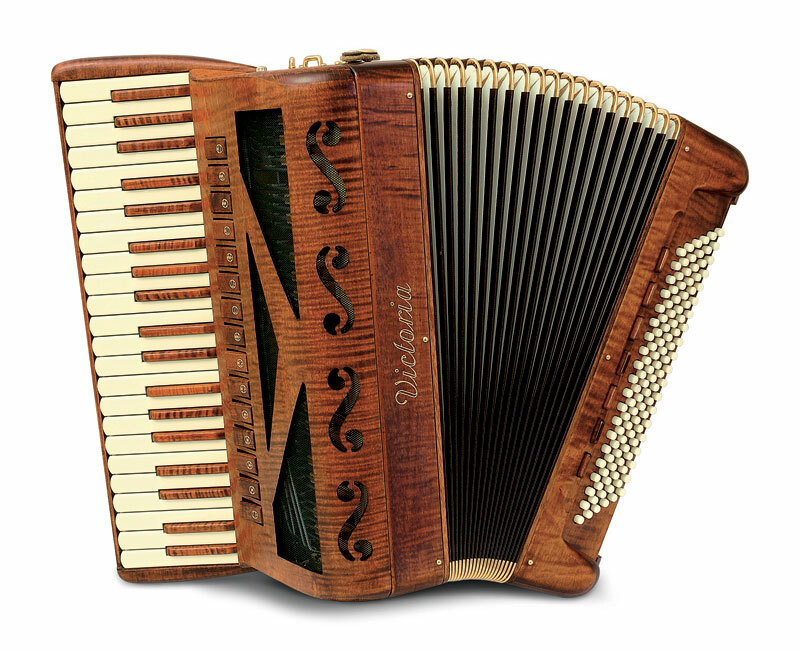 Does the piano accordion in those videos sound or look like any specific Italian models? The bass registers looks a bit like Victoria to me. The solid wood body option also reminds me of them. Not sure about the sound, as I don't really know the Victoria sound. Great looking and sounding boxes, but not sure if I'd want to wait 8 months for one. The way the industry seems to be these days is the component parts could be sourced from just about anywhere. Why do they not just tell us where they are actually made and which Italian maker(s) are involved? The catalogue prices infer if you buy directly from them you'll save on the RRP. Where else can you buy them? You'll see from the catalogue that the distributor also sells Victoria accordions.It might be possible for you to make further comparisons from the photos. I do rather like the simple, understated, more straight-lined look. The blackletter font also adds a little something that makes it stand out from other brand names (not that the font matters in any way, of course). If I had to guess I'd say it's related to the Victoria Poeta. The most striking resemblance is from the bass couplers. Both the couplers and the recess they are in look similar. Might just be a coincidence/inspiration, though. Either way, it would be interesting to know whether it's essentially just a design difference, or whether they have some internals that are not commonly available in the real manufacturer's own line. They need to push up the RRP value 2 or 3 times more. Then I'll consider it. I mean, then you're getting 3 accordions for the price of one, no? Right now, you're only getting about one for the price of one. So in the meantime I'll sandblast the celluloid off an old Hohner to get a solid wood German accordion (and it wouldn't even take 8 months!). (08-02-2019, 12:57 PM)Morne Wrote: I do rather like the simple, understated, more straight-lined look. The blackletter font also adds a little something that makes it stand out from other brand names (not that the font matters in any way, of course). There seem to be a lot of "cottage industry" makers springing up at a time when the industry in general is in decline. Be careful with that sandblaster in case you hit stunningly beautiful plywood, like Maugein use. The make of this one, "Schober" infers the player doesn't drink alcohol. Think I might consider starting a brand in competition with them. (08-02-2019, 01:37 PM)maugein96 Wrote: The make of this one, "Schober" infers the player doesn't drink alcohol. I like the name. It means I can have a many beers as I want and still truthfully claim to be "playing Schober". Is that "Schtone cold schober?" Now that I've had time to compare the photos the only resemblance I can see is the bass coupler switches. They do not appear to share any other similarities at all.